G3328 Tall Jadeite Range Top Salt Pepper Set / Quest for Bids - Find your hidden treasure! 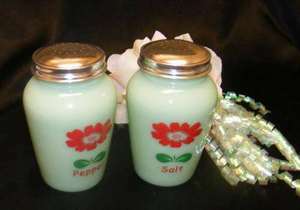 Up for your consideration is a great pair of large round range top salt & pepper shakers made of Jade-ite green glass with a red daisy and leaf decal on the front. These measure 4 1/2" tall x 2 3/4" wide at their widest point. What a great set to have in your kitchen or on your dining table. You won't have to fill these up every often. CONDITION: They come to you brand new with no cracks, chips or repairs double boxed. Never Used.